What child doesn’t love an outing to the zoo? Whether it be marveling over paddling polar bears, feeding slippery sting rays, or simply taking a whirl on the antique carousel, Zoos feel intrinsically attached to childhood. 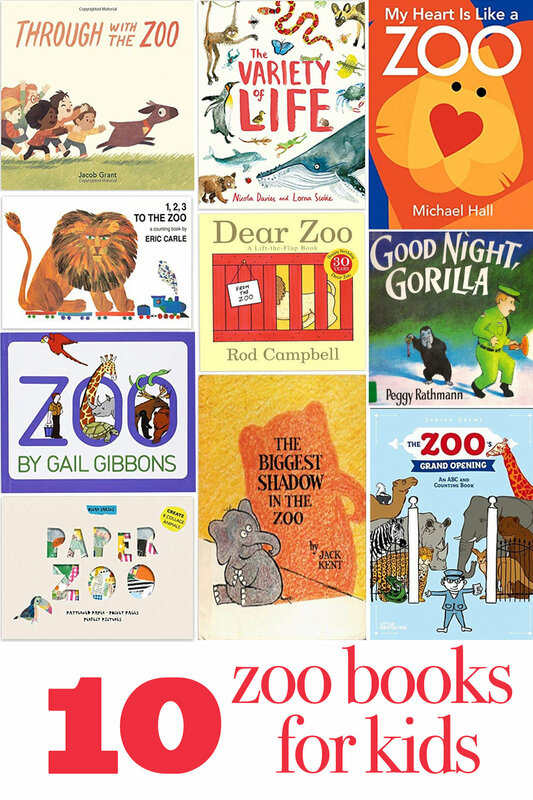 While many books abound about animals, these 10 books were selected (by myself and Emily, the maker mom behind #craftthezoo), to showcase animals that, for one reason or another, can often be found at your local zoo. This nearly-wordless picture book follows the antics of a silly gorilla and his zoo pals sneaking out of the zoo with the help of an unsuspecting zookeeper! The six escaped creatures follow the zookeeper out of the zoo and into his house, where they are discovered by the zookeeper’s wife. We love this funny little story and add new details to the story with each new read. This beautiful non-fiction book shares information about many diverse and fascinating animals and plants found across the Earth. It presents organisms in categories while sharing information about what makes each different species unique. The detailed illustrations and glossary of science vocabulary at the back are my favorite parts of this book. This counting book has a great zoo theme. Readers can count each train car on the zoo train as they see what new and different animals are in each train car. At the end of the book, the train and all of the animals reach the zoo and find their homes. Anchored by beautiful Eric Carle illustrations, this is a great read for toddlers learning to count. This non-fiction book tells about all of the different things that happen at the Zoo every day. It teaches readers about the jobs of zookeepers and other zoo workers, about veterinarians who work with zoo animals, and about what visitors do during at day at the zoo. Readers open to a blank slate, awaiting the arrival of 26 parading animals with corresponding numbers at the top of the page. With some rare choices, children are introduced to exotic animals (and some rather common) that might also live in a zoo. Goat’s life in a petting zoo is anything but calm. On a quest for a bit more personal space Goat escapes the zoo, only to come to an unexpected conclusion. With energetic illustrations, this humorous book is a great read-aloud prior to any zoo outing. What can you make with a fistful of hearts? A beaver, a heron, a lion, or yak! The combinations are endless in this vibrant, shape-filled book. Plus it pairs so nicely with a myriad of book-themed crafts. For little hands that love tearing paper and pasting, this is a hands-on invitation to create collages. Once each masterpiece is finished, children can slip their art between the sturdy pages of 10 familiar looking zoo animals (e.g., crocodile, hippo, and monkey to name a few). This also makes an especially fun gift to give. Unlike the other animals at the zoo Goober lives on an island with a moat, but that’s not what makes him special. With his signature vintage flair, Jack Kent’s humorous read still resonates with readers (young and old) decades after its original publication. Absolutely one to seek out at your local library or thrift store.